October 31st may be famous around the world for being Halloween, but in Catalunya that day holds a different, special significance. It is a day that is known throughout Catalunya as “La Castanyada”, getting its name from the tradition of eating fire-roasted chestnuts – otherwise known as “castanyes”. Directly after this, on November 1st, is “Tots Sants”, a national holiday to celebrate the lives of those who have passed away. During these autumn months, as the leaves start to turn brown and fall off the trees, and a chill starts to spread through the air, you will notice little stands popping up around the streets of Barcelona. It is here on these stands you can find street vendors known as “Castanyeres” selling “castanyes”, as well as “moniatos” – fire roasted sweet potatoes. However, the most famous and traditional cuisine to eat around this time, and especially on “La Castanyada” itself are “panellets”. These are similar to small cakes that are made from marzipan, which is essentially sugar and almonds, and then coated with a topping of the bakers’ choice, although the most traditional topping is usually pine nuts. Of course, it is possible to buy “panellets” all around the stores in Barcelona, but if you want to make the tradition your own, we’re here to give you the best, and tastiest, “panellets” recipe, so you can try it out for yourself. While there are many different varieties of “panellets”, our recipe uses the classic base of almonds, but be sure to check out other types and recipes! Use a fork to mix these ingredients together. Once they start to form a paste start kneading them with your hands until a thick and even paste is formed. Break off pieces of the dough you have made and roll them into small balls, placing each completed one on a piece of baking parchment on a baking tray. Place the pine nuts on each “panellet” and gently push them in so they stick on the surface until covered and then paint with the whisked-up egg yolk for a lovely golden finish. While you are doing this pre-heat the oven to 200 degrees Celsius. Once all the “panellets” are covered, place the tray in the pre-heated oven for 5-10 minutes, or until the “panellets” are a golden-brown colour. Take them out of the oven and leave them to cool. 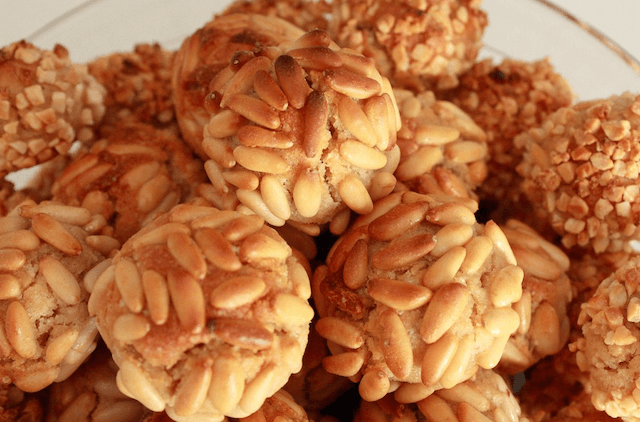 Enjoy your delicious homemade “panellets”! 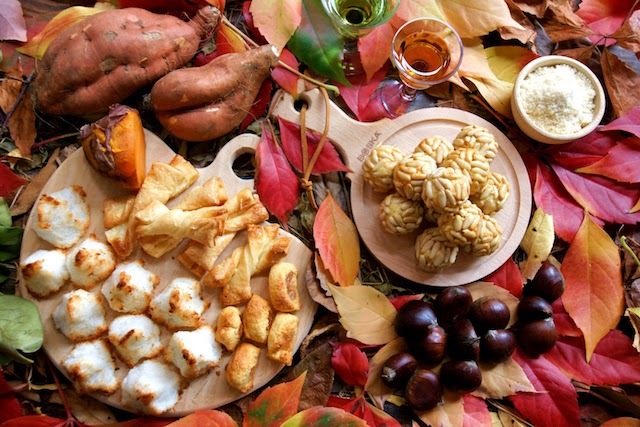 If you want a full festive feast, you could even invite your family and friends round on the day of “La Castanyada”, and eat your homemade “panellets” alongside roasted chestnuts and sweet potatoes to help you embrace the autumn chill!